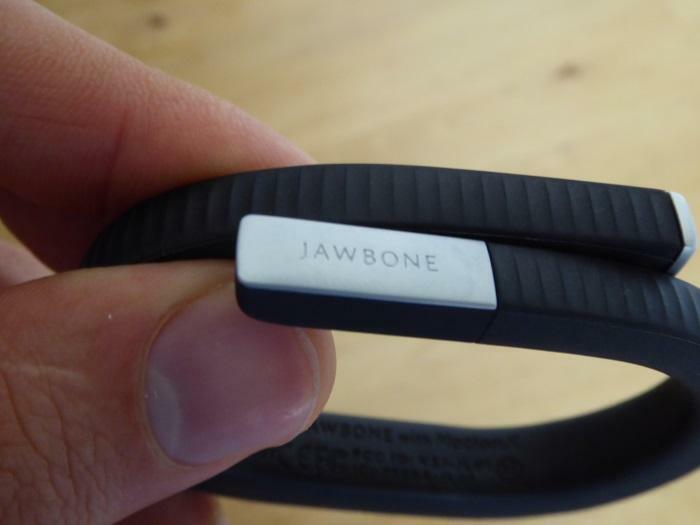 Jawbone’s UP24 is well made, feature rich and good looking enough to not care that it’s on your wrist. The application's interface benefits from fantastic design, granular detail and ease of use, and the system's ability discern deep sleep from light sleep is simply awesome. Sometimes the difference between procrastinating and achieving a goal is a little push. Fortunately for sedentary workers and time-poor sleepers, little pushes are the Jawbone UP24’s speciality. Two components comprise the UP24 experience. One is a patterned wristband that collects data on how you sleep, eat and move; the other is an app that presents this information and offers feedback. The motivational pushes come in the form of “you’ll need to sleep at 9.30 tonight to get 8 hours of sleep”, or in platitudes like “you did it! Just hit...50,000 steps”. The band itself looks simple, but it's obvious a lot of work has gone into its design. The pattern is unique to the new UP24 model. It’s a tad bit wider than its predecessor too, but not to the point where we found it imposing to wear. The UP24 was worn throughout our testing period, whether we were writing, cycling, training, bathing or sleeping. The band is resistant to water, but Jawbone — nor Good Gear Guide — recommend you swim with it on. Bluetooth is the headlining feature separating the old UP from the UP24. Updates are now fed to your smartphone in 5 minute intervals over bluetooth throughout the day, or in 1 minute intervals when you’re sleeping. Wireless connectivity addresses the qualms we had with the previous UP, which required a hard connection to your smartphone before it could be updated. The Bluetooth connection has impacted the battery, but we were perfectly fine with charging the band every seven days. Take the plastic Jawbone case off and the 2.5mm charging contact is exposed. It plugs into a USB adaptor. Sun and moon lights are the only indicators found on the UP24. There’s one button — on the opposing side of the charging contact — and it alternates between modes with either a single press, or a combination of presses reminiscent to morse code. I never bothered learning any of the combination codes, other than the single press which switches you to and from sleep mode. Most of the other modes can be instigated from the smartphone application. These include a stopwatch, a powernap and a smart sleep alarm. The smart sleep alarm is a very clever addition. Here’s an example of how it works. If you set the clock for 6 am, it wakes you up either ten minutes before or after, whichever period your sleep is lightest. The band vibrates to wake you up, meaning the alarm itself is silent; an ideal trait for married couples on different schedules. 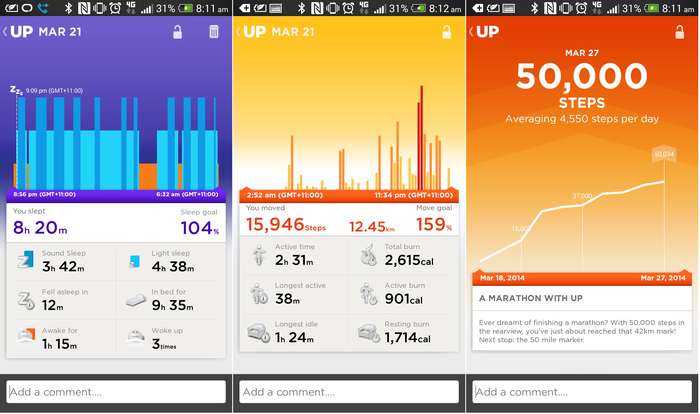 The wristband would be pointless without the fantastic supplementary UP24 app. 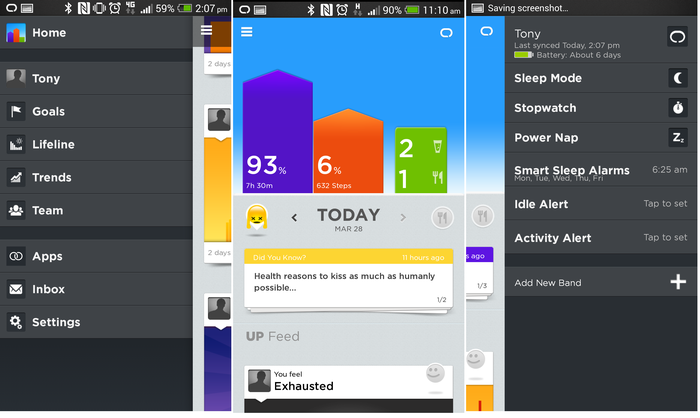 The app is how you glean the collected information regarding your sleeping patterns and your step count. Moreover, it is the means by which you log food and mood information. Navigating the app is a matter of swiping up, down, left or right. 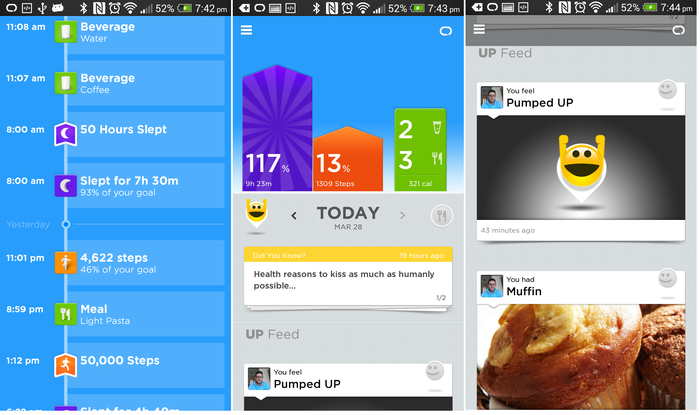 Summaries of your sleep, walk count and your food intake are all displayed on the application’s homescreen. 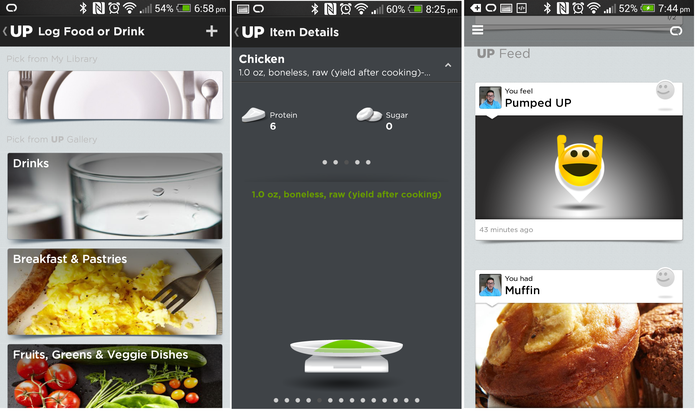 Recording your food intake is possible with the Jawbone UP app. This functionality is a combination of accessing a database populated with the nutritional information of meals, and the ability to enter your own, more specific nutritional values. The Jawbone app will truncate feel-good and ‘Did you know’ style notifications, usually two per day. More often than not they’re clever nuggets of information that’ll keep you focussed on your day-to-day goals. 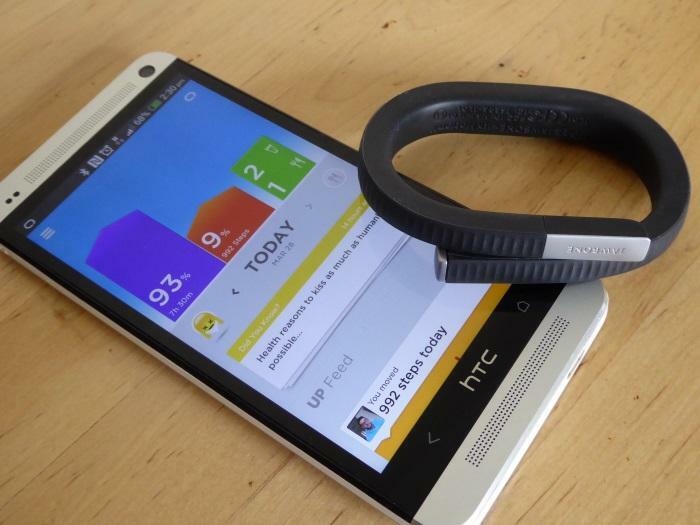 Jawbone’s UP24 is well made, feature rich and good looking enough to not care that it’s on your wrist. The application's interface benefits from fantastic design, granular detail and ease of use, and the system's ability discern deep sleep from light sleep is downright awesome, (we still haven’t cracked the science behind it). Here’s the thing: the UP24 will have to improve people’s lifestyle for it to be a success, and that’s a tall order. In some cases its detailed information and fun insights will fall on deaf ears — and through no fault of its own — people will think it’s futile. But for those who pay attention, well, it could make a real positive difference to their lifestyle. I shall end the review on this note: I usually get six hours of sleep, but last night I slept at 9.30pm.